OK, the champ successfully defended against the prior champ and the newcomer. My friend that I always go with had a bad break with little mistakes in three puzzles but he still managed to beat Dr. Fill. Best is when all your mistakes happen in one puzzle. Really good puzzle by puzzle writeup here. http://throwingthings.blogspot.com/2012/03/i-am-just-ordinary-citizen-who-relies.html. Lots of spoilers of course. is Dr. Fill a colleague of Dr. Beat's? it's apparently the correct answer. 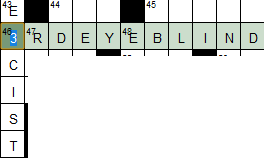 has anyone ever come across a number in a crossword? and can someone explain how "E3CIST" is the answer to "One concerned with right and wrong"? It's not supposed to be "3", it's "THI"